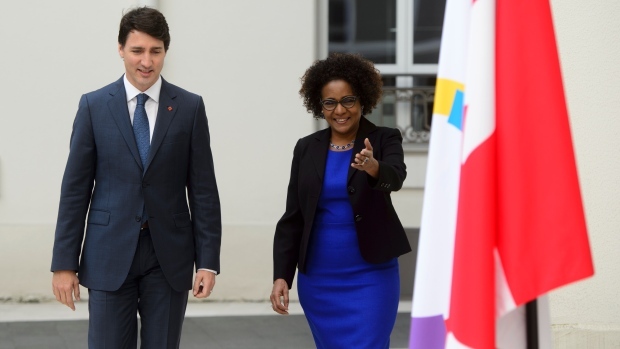 OTTAWA -- The head of the Francophonie, former Canadian governor general Michaelle Jean, thanked Prime Minister Justin Trudeau on Monday for joining the peacekeeping mission in Mali, which is reeling after yet another deadly attack by Islamic militants. The attack occurred Sunday and was launched against two bases near Timbuktu, where militants reportedly disguised as peacekeepers set off several suicide bombs and launched rockets at international forces. One peacekeeper was killed and more than a dozen others, including several French soldiers were injured. Jean lamented the attack as she met with Trudeau at the Francophonie's headquarters in Paris, which the prime minister is visiting this week. She went on to thank Canada for agreeing to send forces to Mali, which is a former French colony and current member of the Francophonie, adding: "The Sahel region, for Mali and for all of us, is a question of high importance." Mali is expected to come up again later today when Trudeau meets with French President Emmanuel Macron, who has made the African country a priority for his government. Canada is planning to send six military helicopters to Mali later this year to help with medical evacuations and the transporting of supplies and ammunition. The helicopters will be based in a different location from Sunday's attack. Mali is considered the most dangerous peacekeeping mission in the world, with 166 blue helmets killed since 2013, more than half by what the UN calls "malicious acts." Much of the prime minister's two-day visit will also focus on trade as Canada looks to ease its reliance on the U.S. market.